Does the Holiday Season mean we have to go off the rails eating wise? While we want everyone to enjoy time with family, eating normal food and even enjoying the delicious Christmas cookies, if you let yourself go completely unchecked, it is going to not only make you feel guilt and shame, but you will have such a big hole to dig out of just to get back to even. Being “too busy this month to workout” is a lame excuse. We all know being busy just means, “I’m choosing not to prioritize this.” Are you too busy to remember to pee when you wake up in the morning? Didn’t think so. Think of your gym routine like you’re morning pee: Non-negotiable. We will be open almost every day, so make it in and get your fitness on with us. You know im not all about those “paleo” desserts, after all they are still desserts. But if you are making the choice to have a cookie, why not have one without all the gluten and dairy ,but still with all the deliciousness. If you have been around CFR for more than a few months, then you have most likely had one of Marisa crossfit cookies, or at least heard of them. They are worthy of the hype and wont leave you nearly as inflamed as their normal counterparts. For the most part, they’re are full of healthy fats. Doesn’t mean you should have 12 of them, but they’re quite rich and will keep you satiated against those other more detrimental cookies in the line-up. Thanks Bonz! 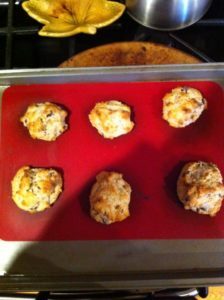 3 cups almond flour (I use Trader Joes almond meal…it’s the best) and I use 3 heaping cups. Combine dry ingredients. In another bowl, beat the eggs, honey, and vanilla extract with a hand mixer. Pour dry ingredients into wet ingredients and beat with mixer until combined. Add the melted coconut oil and continue to blend until combined. Stir in chocolate chips. When you’re surrounded by endless finger foods, it’s hard to know how much you’re consuming. Instead of attacking the never-ending flow of hors d’oeuvres one-by-one all night and eating standing up, grab a plate and fill it with a reasonable amount of food. Like the video I shared on thanksgiving, include some protein on your plate just like you normally would. It’ll help you monitor how much food you’re actually consuming and might prevent the binge of the century. It’s OK to cheat over the holidays, but it’s best to come up with a plan. Christmas dinner is likely going to be one night of guilt-free eating and maybe drinking. But not every Christmas event or meal has to be the greatest feast of your life. Knowing you have a cheat meal around the corner the next meal, or the next day, may keep you more in check during your other meals, or snacks, of the day. What we’re asking you to do is hard. Harder for some than others. If you do mess up, let it go! Registered Dietician Jennifer Broxterman of NutritionRx (www.nutritionrx.ca) likens it to brushing your teeth. “Everyone has forgotten to brush their teeth here or there, but you normally don’t beat yourself up about if. Not brushing your teeth once doesn’t lead to a spiral effect of not brushing your teeth for a week. But that often happens with food. Someone ‘cheats,’ and then this spirals into a week of bad eating,” she said. thanks to Emily Beers for the help with the article.